The draftwatermark package implements a few simple commands for adding watermarks to documents. It provides some flexibility that is sufficient in most cases. The following 5 properties of a watermark can be modified through commands defined by the package. The color package is automatically loaded with draftwatermark. To get a watermark across the whole page, you probably want to set scale to a value somewhere around five. The option nostamp will suppress any watermark. Link to the draftwatermark package documentation. A code-based, but certainly more flexible approach was described by Filox on his blog. It’s a really good tip, but I have a question. How can I add a image watermark?. I need to make a template letter for company, but need the logo behind the text. The graphicx package is required by draftwatermark and therefore, you won’t need to load it again. Dear Tom, Thanks for this. Could you please help me What command should i use in order to place text message i.e. “Under Review” in the every page background in my IEEE survey paper. Draft is appearing for every pages but while compiling it was showing following types of Latex Warning and so failed to display all my tables and figures. LaTex Warning: Reference ‘table:nonlin’ on page 1 undefined on input line 168. Please help me to short out the above mention problems. You probably just have to make sure you get the number of curly brackets right. Count how many you opening and closing brackets. It seems that you don’t need the last two “}”, just try. Also you seem to reference a table that has either no label or the spelling is different (warning). I will move your comments to a post where they seem to fit and block comments for this page. This is to benefit others who are having the same or similar problems. Hi Tom, Your blog is awesome!!! Thanks for your command and the minimum working example. Running the code does not produce an error in my editor though. I suspect you don’t have the latest version of the package. According to the documentation colored watermarks were only added at the beginning of this year (Jan 2012). I suggest updating your LaTeX distribution. Let me know if that didn’t help. I didn’t read the documentation, but in your comment, I can see the date of the update (Jan 2012). I think that’s my problem. I’m using Debian GNU/Linux, sqeeze. I’m going to try update my packages manually because with a ‘apt-get update’ doesn’t find any update. Thanks for your rapid answer. Hope updating you distribution / the package will fix the problem. Good luck! I tried to use this package with a “letter” class (actually “lettre”) instead of an “article” class but it did not work. There seems to be a problem indeed. The class lettre somehow uses a different page layout. I can see the watermark, but its shifted to the top-right corner. It works with the letter documentclass, so maybe you want to consider changing documentclass. I will get back to you if I can think of any work-around. Thanks, really helpful and easy to implement! Great, thanks for your comment! Dear Sir Tom Could u pls tell me how how to make latex to make use of entire page,I mean it is leaving some space at the bottom of every page and I was not able to fill it up.I had even kept \pagebreak after 6-7 lines (the space is such that 6-7 lines could fit in it.Even then it is writing only those 6-7 lines in another new page and remaining in another page(3rd). Thanks for your request. If you are not satisfied with the margins defined by default, you can change these through the geometry package. How could I make the draft note start from,say, page 3 or show only at odd pages or some specific pages? Thanks for your question. 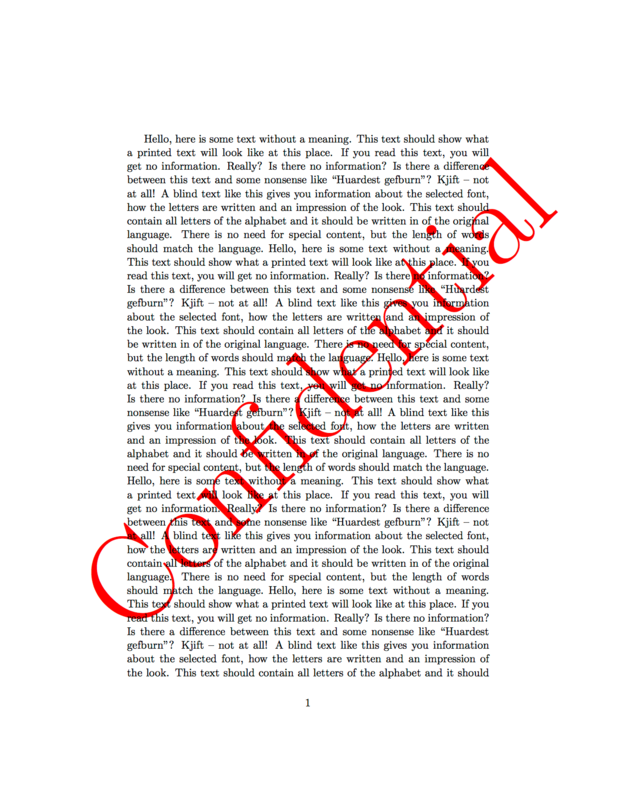 In the example below, the watermark is only printed on odd pages greater 1. With that, you should be able derive the two scenarios you were interested in. Thanks, that’s an interesting question. The draftwatermark package has some limitations. Below is a possible solution using background. Just ask if you need help with the code. I adapted the code from here. How do i put a watermark on top of pictures, mine goes below them. Thanks for your question. It seems this is not possible with the package discussed in the article. However, the xwatermark package provides that functionality. See here for more details. Great to hear. Thanks for the feedback. Best, Tom. Can this package also make the watermark stay on top of images? Is it possible to do multi line water mark? The \parbox macro adds line breaks. However, the behavior seems a little unpredictable. I included a reasonably looking example below.